sounds great! I'd love to win one! Fun! I could make all kinds of neat things for my daughter with this. I would LOVE one of these - gift possibilities are endless!!! Love it! I can think of so many fun projects to do with this! Ive been wanting to try one of these for a long time!! I want to etch the glass in my kitchen door that leads to my laundry room so this would be great! Thanks for the chance. I would love to win this! I have been wanting a silhouette for some time now. Thanks for the giveaway. I have been wanting to try the glass etching. Those glasses are so cute. I'd love to etch my kid's initials onto their glasses so I remember whose is whose throughout the day. I'm slowing transitioning them to glass instead of the multi colored plastic ones we have. Thanks for the giveaway! Since I started reading your blog, over a year ago, I've wanted a Silhouette. You make the the most amazing and creative things with it, and I'd love to have one, too! Awesome giveaway. Thanks for the chance to win! Oh what I could do with this machine! thanks for the giveaway! I would love to try out the etching - what a fun project! Oh...how fun! I'd love to make some...many....lots..! Those look awesome! Haven't tried etching yet but want to! OMG! My husband would love those shot glasses. He is such a nerd and loves comic books and super hero movies! Did you purchase those shapes through the silhouette store? Love them! I have wanted one for so long, but just can't pull the trigger. It's a big investment. I would so love to win one. Early Christmas for me! I'd love to have one! Thanks for the giveaway! I'd LOVE a Silhouette! Too expensive for me to pick up on my own, but I know I'd go to town with it if I had one. Thanks for the awesome giveaway! I have always wanted one of these! What a great giveaway. These are so neat! I would love to have one!! I hope I can win I've always wanted one! Thanks for the giveaway! I love your projects! This is AWESOME! I am imagining all the gifts I could make! So fun! Those glasses are awesome! Thanks for the opportunity to win! I love your blog, and missed it this summer. I just love serendipity! Last night, my 12 year old son said it would be great to "make designs that stick to mason jars" to give as holiday presents this year (we use them for EVERYTHING!). This morning I was looking through the Summer 2012 issue of Living Crafts mag for some sewing inspiration. I saw the bit about your upcycling, and had to check out your blog....and here I am, happy and grateful to find the inspiration I was seeking, as well as the opportunity to take a chance on something that will "make designs that stick" to glass! I so want one of these! Thanks for the opportunity to win one! That looks like a great tool. I would love to etch my name into my glass dishes to get them back instead of the old masking tape. We etched some glasses with a princess theme using your tutorial from before. The etching rub is magical stuff...if you remember to shake it up before using it :) Glad to see you back and enjoy the ideas you give my wife and I. Great giveaway too! I would LOVE to win a silhouette, thanks for the chance! A Silhouette is one of the only things I enter to win on blogs, as well. It sounds like we have a similar idea of what constitutes a great giveaway! Those glasses are so stinkin' cute!!! I am dying to get one of these - I would love to make monogrammed items to give away as gifts this year!! Would love to win a silhouette, since I could use it for tons of projects and it is just not in the budget right now! Thanks for hosting an awesome giveaway. I want a silhouette so bad! Thanks for the giveaway and for your inspiring blog! Love those glasses! Anything superhero is big at our house! I can't wait to try the etched glass! Etching glass is one of the items on my crafting to-do list. :) I want to add subtle numbers to the base of our wine glasses so that people can remember their number at dinners instead of where they put their glass. What a great giveaway! Thanks so much for doing this. I would love a Silhouette!! What a great giveaway, thank you! I have been reading about silhouettes forever and I would love to have one of my own. OH EM GEE!! I want one sooo badly! Fingers crossed and thank you for the fun giveaway. Who doesn't love a giveaway! I hope I win, I hope I win! I've been drooling over a silhouette for ever... crossing my fingers! Love all the creative things you have used your silhouette for. You have a great imagination. Thank you for offering the giveaway. I was just looking on Pinterest for DIY Glass Etching - I love the Super hero cups! My son would love those! What a great giveaway! I could have so much fun with this. Those cups are awesome! Thanks! 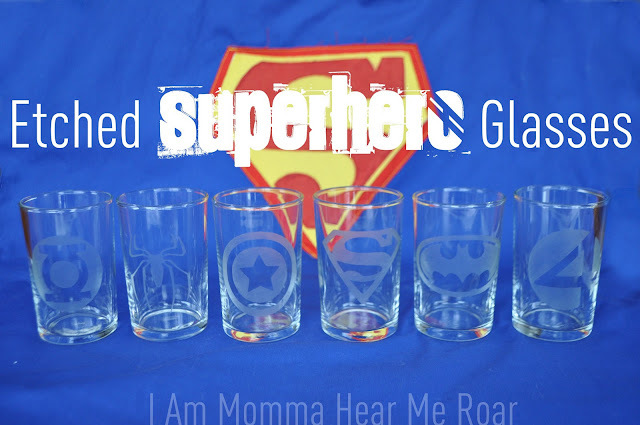 LOVE these Superhero glasses and I have two superheroes here at home that would LOVE them! Thanks for the chance to win! This is great. I think I will be doing some etching for the holidays. Those are awesome glasses. I love how there's so many things a silhouette can do. Love the glasses! I've been dying for a Silhouette for years now, and it has never fit into our budget, hopefully this will be my lucky day! Love it! I'm excited to try this out! My hubby and I each designed a beer mug with etching cream and wait for it....electrical tape! He cut out this amazing intricate design with scales etc. on a koi fish all by hand with a scalpel and it turned out amazing but omg a silhouette would be a lot easier huh? My little guy is VERY jealous of the Superhero glasses--may have to add them to my (ever expanding) TO DO list! Great giveaway--thanks! I've been wanting to try etching cream forever! Love those glasses. How fun!! I have to make those glasses! Hooray for giveaways. I rarely enter them, but I will for a silhouette. Oh my goodness. I LOVE the superhero glasses and so would my boys! Thank you for the chance to win one of these amazing machines. I always like giveaways. I enjoy reading your blog. it makes me want to be a little more crafty. My kids love superhero's and I words can not describe how excited I would be to will a machine! This would be great! Love it! Would love to win - this looks like a great project! I enter every single time anyone gives one of these away. I've got to win one eventually, right? I see all the amazing projects you do with your silhouette and I always wish I had one too! I've been wanting one of these so badly lately. I would love to have one of these, they look easy to use! I would love to win! I have been wanting a portrait/cameo for a long time now. The crafting possibilities would be endless! Thanks for such a great giveaway! I thank you for the chance to win. I try to do something crafty every day so I could really put this machine to good use. Thanks again for the chance. Those glasses are the cutest! I feel like I NEED them in my life. I would make these for sure if I were to win! The etching kit looks awesome!! I so need a Silhouette! I wish I had my own sillouette! My sister has one and I can only borrow it so often! What a fun thing to play with! We are in all things superhero right now. Love this post. Such an awesome idea, those glasses! My daughter just had her 4th birthday party - Captain America themed. I can't pass up free! I'd love one. Great Idea. Such a fun thing for a birthday or party! 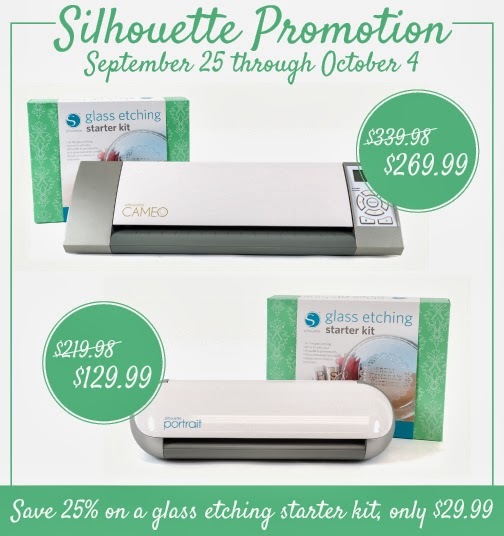 Oh, I've been hoping for a Silhouette for a couple years now, and this etching kit looks like sooo much fun! Adorable glasses, by the way. Ohh! I would love to win the Silhouette! Holy cow! This is my giveaway! I recently found your blog and read through all of the posts, pinned a bunch and decided I love your work. But the etching was my favorite, I want to etch a table so bad! Or a mirror as a wedding present (last name and established year!). So cool, I hope I win!!! I have been wanting a Silhouette for-EVER! Oh I would so love to win this! I have so many projects that I would love to use the Silhouette to complete! Oh, I love Silhouette giveaways (even if I never win). :) Thanks for the chance! I bought my Silhouette used a long time ago. I would love to have a shiny brand new one to play with! Awesome giveaway. I love your blog! So many great ideas, thank you for the inspiration. I'm so glad you're back!! You have such great, realistic ideas. This would be so fun to win! I would love to win one and then I could make all the cool stuff you make! Those superhero glasses are awesome! I've never done any glass etching before but I'd love to monogram bathroom accessories and my flour and sugar containers...endless possibilites! Thanks for the givewaway - one of these would be awesome! I can't believe I have gone this long without one of these! I loved this project! I made some with some friends and they are our favorite cups! Thanks for the awesome giveaway! Would love one of these. Glad to have you back! Would love to win! Thanks for the chance to win one! I'd love to win one! Pick me, pick me! Love your blog, love you! Thanks for the giveaway! I've always wanted one. Would love to do the glass etching -- how fun! I love etched glass ive never tried it before but i would love to! and would love to win this! I have loved these since the first time around - and I reaaaally want the silhouette! Those super hero glasses are awesome! I'd love to be able to create projects with a silhouette. how fun! Thanks for hosting a giveaway! I would love a silhouette! Want one of these so bad! But every time I save up there is something wrong with the car or other expense. Winning one would be great! This would be really fun to learn how to use. I so desperately want one of these. I used to work in a sign shop and LOVED designing, cutting, and applying vinyl to things. I could get into SO much more trouble with all the awesome things the Silhouette's do, though. How cool! I tried etching glass before, but I didn't have a good way of cutting my stencil, and it really didn't work out. Amazing giveaway....I would have so much fun with one of those!! A Silhouette would make my crafting life so much easier. Fingers crossed! A Silhouette would be incredible! I would love to win, love the glasses too! Cheri, in your earlier posts about your life style food change, would you mind posting some ideas your boys love for lunches and dinners. We watched Hungry for Change and we are working on making the food change to become much more healthy! Thanks for posting that!!! Thanks for the chance to enter, I would love to win one of these! How awesome! I can only imagine the damage I could do with a Silhouette! This is so rad! I love your glasses too! Love those glasses. I actually made a set for my husband for his birthday last year. Never saw these glasses before but they look way cool! I've been wanting one of those machines for a while and those glasses would be perfect for my family. I hope I win. Not in the budget this year, so I would love to win one! Love your blog!! Would be so fun to try out the silhouette!!! I have been wanting one of those, I hope I win! Thanks! There are so many cool things you can do with a silhouette! I'd love to win one! I've been using my Silhouette SD and having so much fun. Think what I could do with a Portrait! I have wanted this for so long! There are so many projects I have wanted to do!! I just saw one of these (a Silhouette) in person for the first time, and now I *really* want one! I would love to win a silhouette!!! I think of something to use a silhouette for at least once a day! No piece of glass in my house would be safe if I had the etching tool. Thank you for the giveaway! Would love to win one and I adore the little glasses you made!! I'm so glad you are back! I would love to win one of these, because they are too expensive for me to purchase at this time, but I love to see all that you use yours for! I enjoy reading your blog - thanks for hosting a give away!! Would love to be a proud new owner of it!! I feel like I could do some more decor around the house, with love & a silhouette! This looks so awesome. I'd love to win one. Fun giveaway! I would love to win the silhouette! So awesome! I would have so much fun crafting with the silhouette! I'd love to have a silhouette...love their products! I love your project! Thanks for the great giveaway! Love the glasses!! Thanks for the giveaway! That would be so awesome! I've been wanting a silhouette for a long time! I love love love my silhouette. Would be wonderful to win one to give to my sister for Christmas! I love this! My nephews would love glasses like that! Silhouette is on my Christmas list this year! I had no idea what a Silhouette was untill about a year ago when i can across your blog, and now its the one thing i need and want to complete my craft room! I love doing the freezer paper shirts for my kids and it would make it sooooo much easier and faster for me and i would be able to make them all the time! I really hope i win this one!!! We have these glasses that have handles that use to have jam in them. I need to etch them with the kid's initials or something so they know whose are whose. I would love to win this, it would be so great for holiday presents coming up! Oh how I would love to win one!!! I would love to have a Silhouette! !